Peaches: Hey! Those are MY carrots! 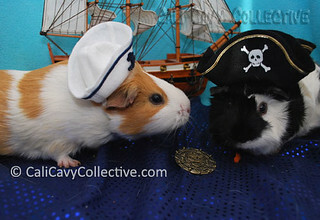 Intent upon retrieving her pirates booty, Revy the Pirate launched an offensive upon Captain Peaches ship. She invaded the USS Lettuce, pillaging it of all the carrots stored in its hold. Captain Peaches caught wind of the ruckus happening right under her piggy whiskers and came down to see what was going on. "You can't take those carrots, those are for me and my crew!" squealed Peaches - and promptly challenged Revy to a tug-of-war carrot duel. 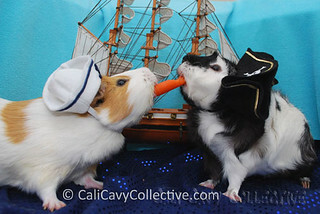 Captain Peaches and Revy the Pirate each took one end of a carrot and started pulling with all their might, but soon found that they were evenly matched. Reaching a stalemate, Peaches paused. "Why are whee dueling for this measly store of carrots when we could be off searching for the Endless Fountain of Food?" she asked. "Why, because you have my pieces of eight!" replied the ruffled pirate. "Well, pieces of eight are fine and all, but they are certainly not edible. At the Endless Fountain of Food, there are more fruits, veggies and hay than an entire fleet of piggies could eat! How about I return your pieces of eight, and you join me on my quest instead? " inquired Peaches. 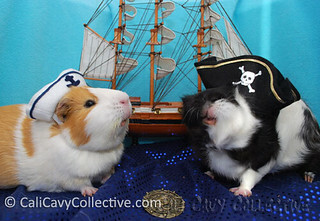 Reaching an accord, Captain Peaches and Revy the Pirate touched noses in agreement. 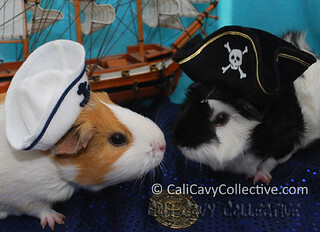 And off our two heroes sailed on the USS Lettuce, united on their quest to search for the Endless Fountain of Food. Thanks Vegan Wheekers! Persuading stubborn piggies to pose for photos can be difficult, lots of veggie bribes were involved.